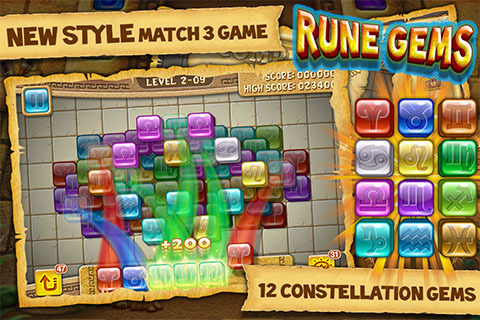 Rune Gems is a new & unique puzzle game. 1) You have a tray that holds 7 tiles. 2) Any tile you tap goes into your tray. 3) All tiles that enter your tray are automatically sorted by color and once you have EXACTLY 3 matching tiles of one of one color, those 3 tiles disappear and you score some points. 4) If you happen to tap on too many unmatched tiles so as to clog up the tray with no way to form a group of three matching tiles from the available tiles on the board, the game ends the second you add that 7th tile and it isn’t immediately part of an existing set. 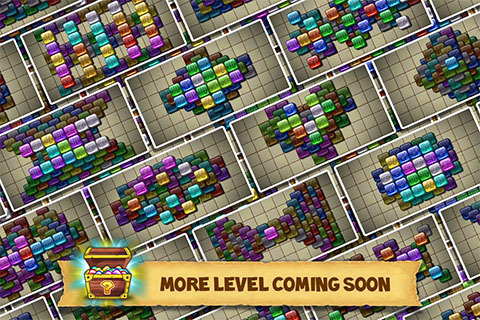 Since a grouping can NEVER be more than 3, is to simply match as many triplets as fast as possible for an escalating speed combo bonus…but be careful, if in your haste you end up tapping on 4 red pieces, that 4th piece will now sit on the tray clogging stuff up until you find it two more partners. So always be mindful of what you put on the tray and make sure you can match it off quickly or letting it clog the flow up a bit is worth it if it is blocking your access to many other tiles underneath. Great game. Fun and challenging. I’m really enjoying the game. Can’t wait to see what comes next! Keep up the good work you guys, and thank you! Thank you for playing we game! I reall like this game. I purchased the extension but it won’t download. It says fail when I try to restore. I really enjoyed the demo and I want to play the rest of the game. Thank you for your feedback, we’ll check for you problem, once we find out, we’ll contact you. Nice game, I like it. Love your game and got really addicted, but since the update every time I finish a level (eg 5-9) I go back to level 1-1 automatically. Thank for your feedback,This bug will fixed as soon as possible.we appreciate your great support. I love playing the game. The game will not let us go past level 8 ……I love this game my family and I take turns on the puzzles on the levels as a family challenge. Can you help fix this issue so we continue enjoying this awesome game !! How can I get past level 8? Help! This game is so addictive, I don’t want to just stop. I past all level, but why the new upgrade of 9-9, 9-12, 9-14 no time points? I got 3stars without that three? No sé como se pueden conseguir “comodines” de vuelta a tras y de sugerencia. Por favor expliquenlo, gracias. Thank you for your little ‘I miss you come play me’ notes. I’ll play u again when new levels are added. no comprendo como te dan medallas, tiene que ver con los puntos o con ola velocidad ? Thank you for your feedback, if you want to get three stars , time is the key, you must pass the level as fast as you can. I looove the game! Although i’m having difficulty with the star system… In several levels i got a super high score and got 2 stars. For example in one level i scored 72000 and got two stars and while trying to get three stars i once scored 42000 and got them. It happened in several levels especially at the fourth stage. Other than that i love it! Well done! Cannot finish with the three coins in every spot and cannot go to level five to mob on. What the secret to getting all the coins on the spots? Great game !Please add new levels!!! Great game Can one expect it to be out on any other platform soon? This game is so addicting once you start it is so hard to stop. It is a pretty neat game though. Thank you for giving me the ability to play your game. This is my favourite game, but now I bought a Samsung tablet (Android). Does this mean my Rune Gems pleasure ends here??? 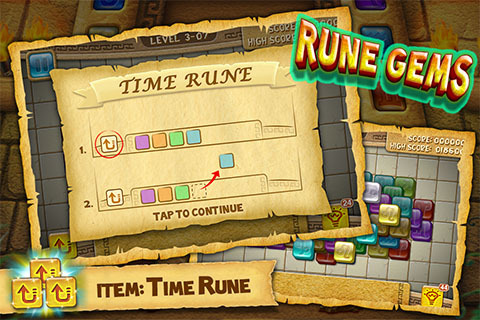 Thanks for your feedback, Rune Gems android version will be coming soon. Where van I find the Android version? I love playing. Has strategy with a little bit of luck in how the tiles are later out. I have to say the star system is a bit frustrating. No real explanation on how to get three stars. Mentioned on here it is time but not sure that is the case?? If so, then it would be nice to have a timer and with a set time to beat for each layout. Or when you are finished it should give you your time. Otherwise a great game! Great game! One of the best! Please, give us the Android version!! I miss it so much! Please transfer it to Android!!! Will this game ever be updated? New levels are really appreciated. Love the game, BUT, please, make the opportunity to switch off the music. Is there a difference between Rune Gems and Rune Gems Deluxe? 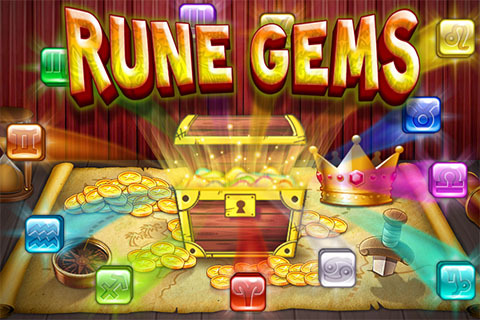 I download Rune Gems on the Apple App Store and have paid for the extra levels. I’m just wondering if there is anything else in the Deluxe version that is not in the base version like extra game modes. Great game. 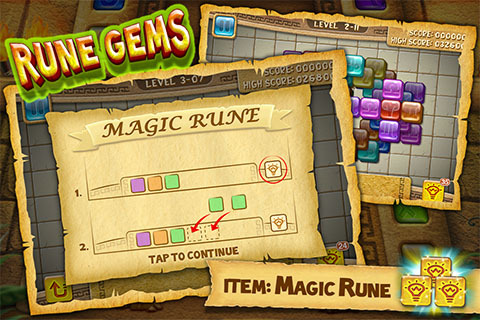 Rune Gems Deluxe already contained the extra levels, and will support iPhone XS, and update new levels. It was so fun that I tried to download it. It’s not in the Playstore. If possible, can I play the Lundemes with Android? 2018 StarSprite Studios. All Rights Reserved. 2018 StarSprite Studios. All Rights Reserved.